Thank goodness for Bloom Day, because otherwise, I doubt I’d have taken the time to really look at the garden this month. I’ve been so focused on collecting seeds that I barely notice the flowers. But I’m glad I had this chance, because I suspect that we’re going to be in for a very early frost this year, so these beauties may not be around for much longer. First, some close-ups. 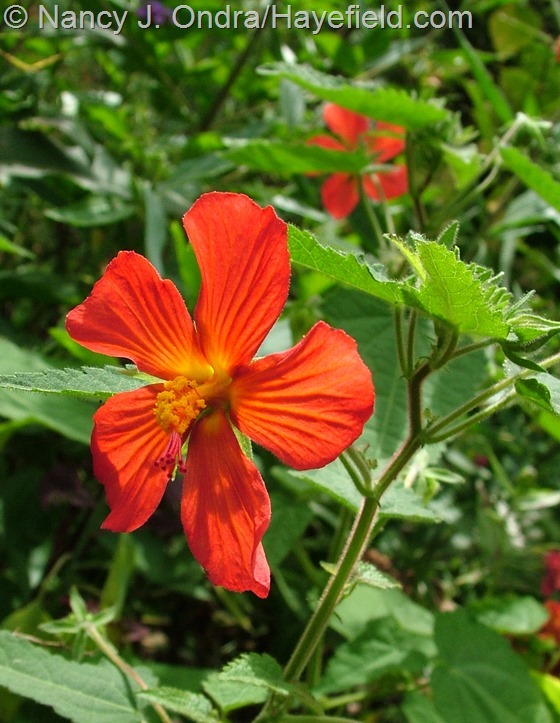 A couple of new annuals for me this year, thanks to reader Rick R.: above, scarlet pentapetes (Pentapetes phoenicea); below, red mallow (Pavonia missionum). These just started flowering, but I really hope I can get some seeds from them. 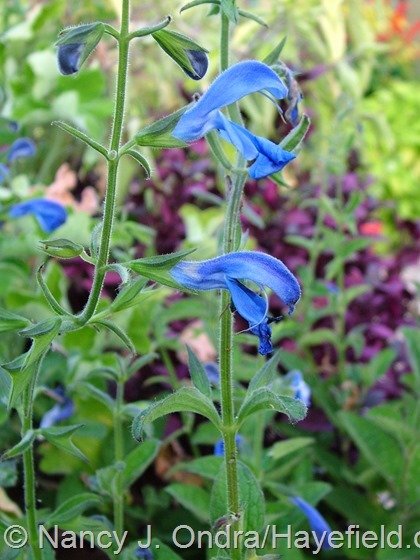 Two more plants that just started flowering this month: above, ‘Patio Deep Blue’ gentian sage (Salvia patens); below, lion’s tail (Leonotis nepetifolia). Both of these are annuals here. Most of the sanguisorbas I have are later bloomers, but this one—Sanguisorba menziesii ‘Dali Marble’—is the latest, opening just a few days ago. I really need to start cutting this one back hard in June, as I do all the others, to keep it shorter and bushier. The ‘Flying’ Dragon’ hardy orange (Poncirus trifoliata) does a fair job holding most of it upright, but the 8-foot stems are very likely to keel over if they get loose. 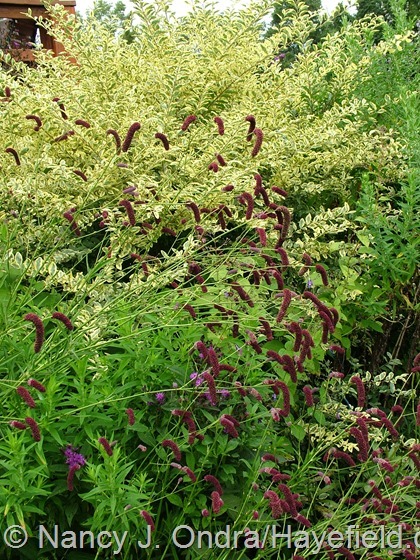 These two smaller-scale perennials have been in bloom since July: above, ‘White Cloud’ calamint (Calamintha nepeta); below, ‘Golden Arrow’ mountain fleeceflower (Persicaria amplexicaulis). 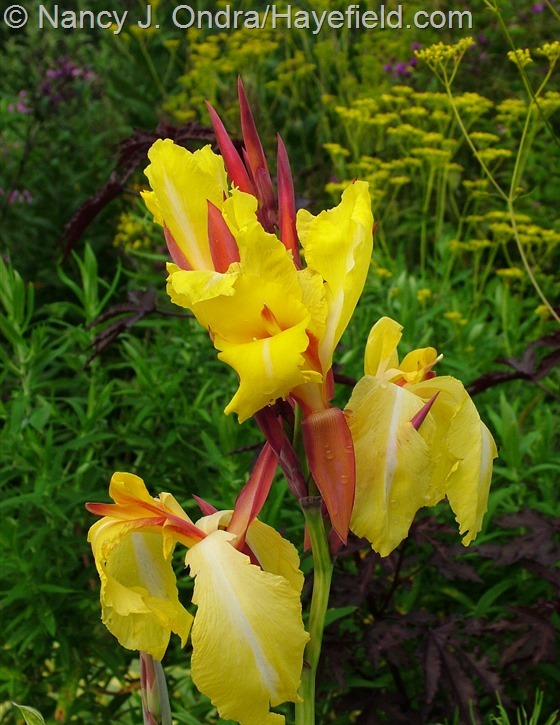 It’s been many years since I’ve grown ‘Nirvana’ (or ‘Minerva’ or ‘Striped Beauty’ or whatever-other-name-you-prefer) canna, so I’d forgotten that the flowers are as pretty as the yellow-striped leaves. The black-leaved cotton (Gossypium herbaceum ‘Nigra’) flowered beautifully this summer and has set lots of pods, but they’re maturing very slowly, and I have a bad feeling that they’re not going to ripen before it gets too cold. I have mixed luck with morning glories, but I’m really impressed with this one: Ipomoea nil ‘Cornell’. The white-edged pink flowers are abundant and stay open during the day. The vines are vigorous but not so densely leafy that you can’t pair it with another climber. 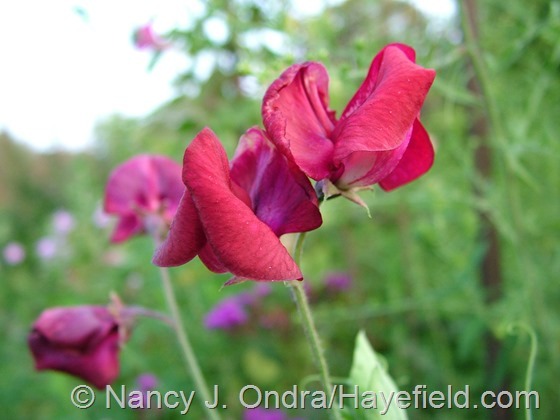 On one trellis, I have ‘Cornell’ with this rich red sweet pea (Lathyrus odoratus), which has been in bloom since July. It’s not a great color combo, but I’m delighted just to have sweet pea flowers to sniff at this time of year. 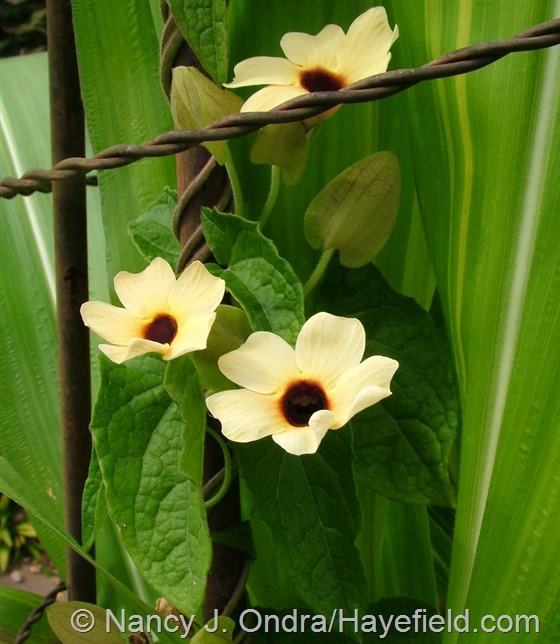 The annual black-eyed Susan vines (Thunbergia alata) tend to be late bloomers here, especially when they self-sow. 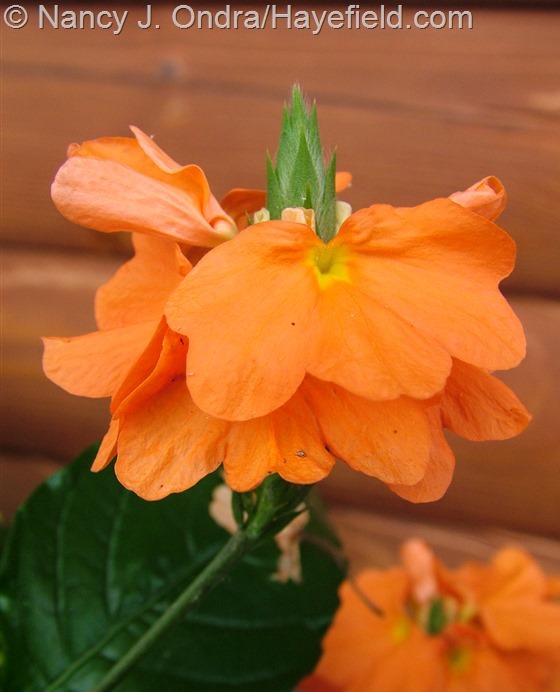 Above is ‘Blushing Susie’; below is ‘Susie Clear-Eyed Orange’ (a.k.a. 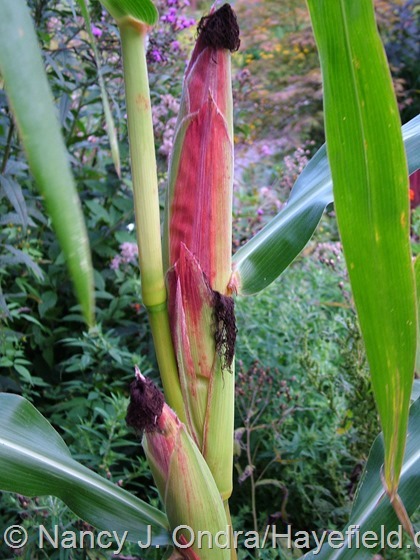 ‘Susie Orange Clear’) scrambling up Tropicanna canna (Canna ‘Phasion’). 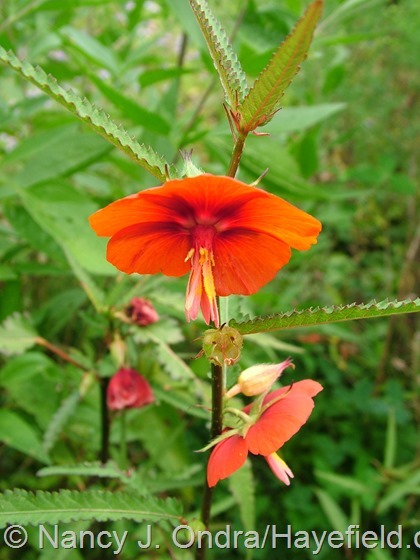 A couple new favorites: above, tender perennial ‘Orange Marmalade’ firecracker (Crossandra infundibuliformis); below, flower-of-an-hour (Hibiscus trionum; thanks for the sharing the seeds, Kerry). 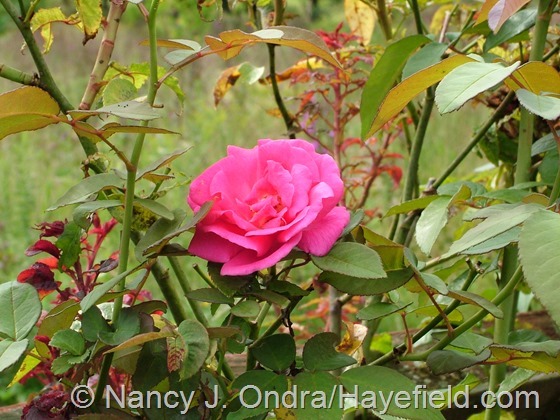 And a goodbye to an old favorite: after a spectacular first bloom in June, dear ‘Zephirine Drouhin’ produced a huge flush of the bright red shoots that signal rose rosette disease. She’s growing just a few feet from infected multiflora roses in the meadow, so I’m amazed she lasted this long. I’m enjoying her last few blooms and will remove her remains this winter. Bye, Zeffy. On a happier note, the succulents seem to be quite happy since it’s gotten cooler. Below is pencil cactus (Euphorbia tirucalli). 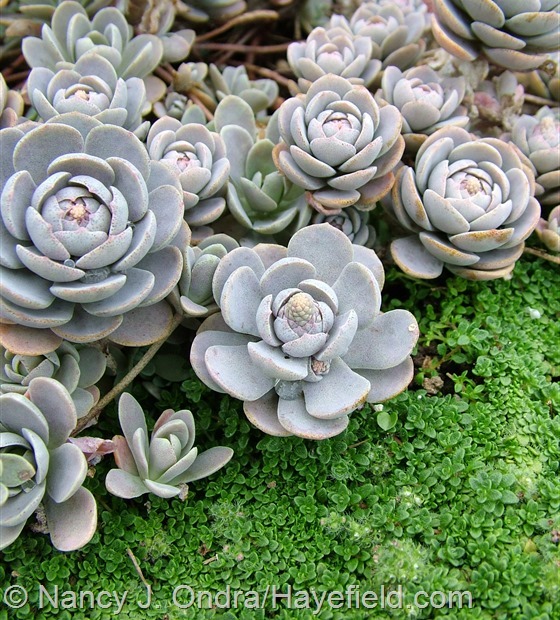 Above, Orostachys malacophylla var. 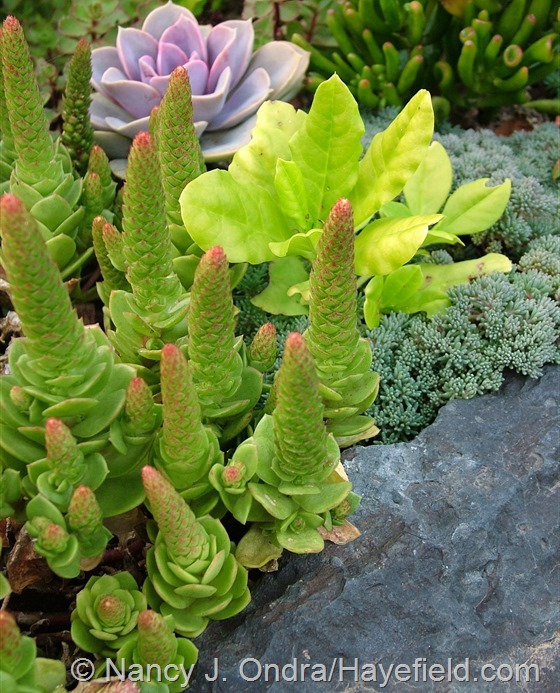 aggregata with Sedum hispanicum var. 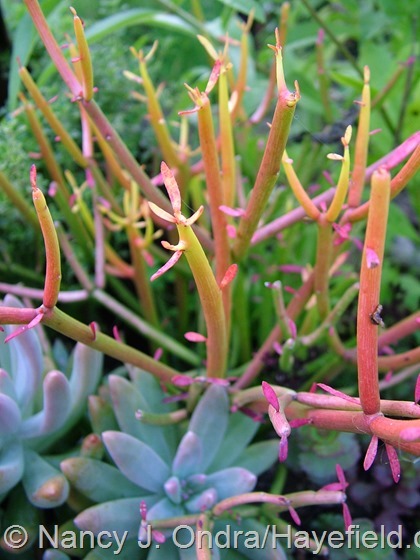 minus, Talinum paniculatum ‘Kingwood Gold’, and Echeveria ‘Perle von Nurnberg’. Below, Orostachys malacophylla var. 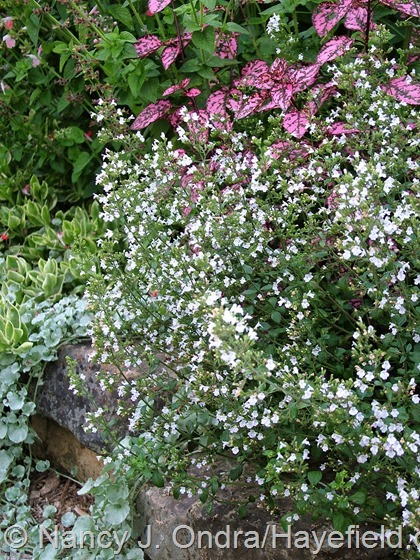 iwarenge with ‘Elfin’ thyme (Thymus serpyllum). 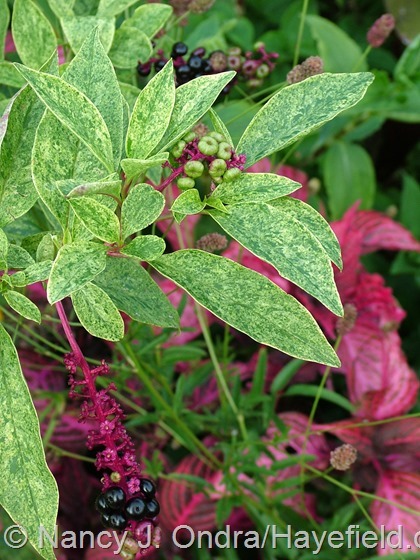 …and variegated pokeweed (Phytolacca americana ‘Silberstein’). This is a great time of year for the edibles, too. 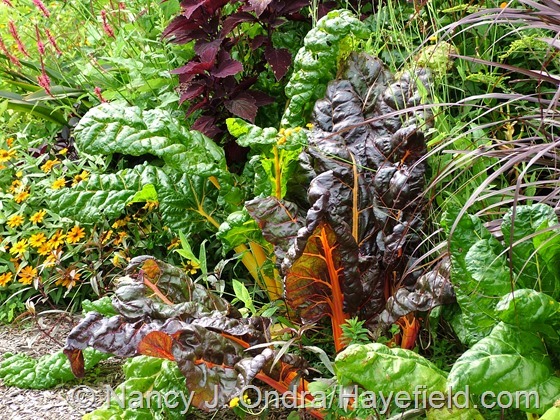 Above is ‘Bright Lights’ Swiss chard. 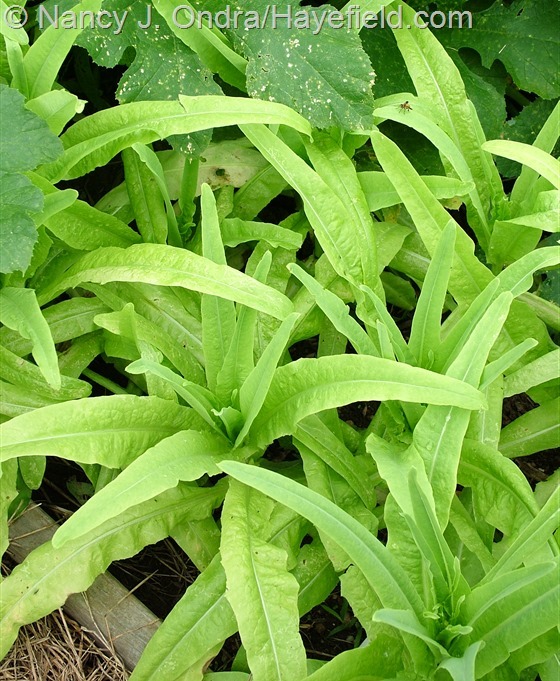 Below is stem lettuce (Lactuca sativa var. asparagina), also known as celtuce, with edible leaves and stems. It was a spectacular year for the ‘Concord’ grapes. Even with all the rain (and no spraying), the vines were gorgeous and absolutely loaded with fruit. 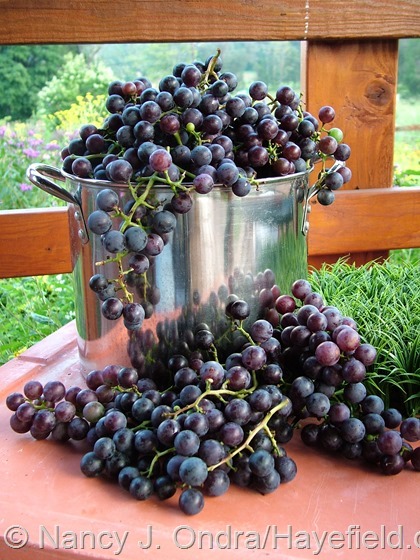 I’ve gotten to enjoy lots of fresh grapes every day for several weeks and harvested several bushels to share with a friend, too. 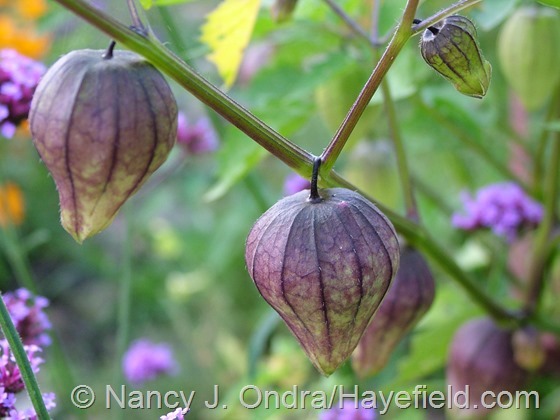 Haven’t yet gotten up the nerve to try the ‘Purple de Milpa’ tomatillos, though. Come to think of it, I’ve never had any tomatillo, so I guess I’m in for a new experience. I hope I like them, because there are lots. They’re very pretty, anyway. And Dee, thanks for the ‘Hill Country Red’ okra! 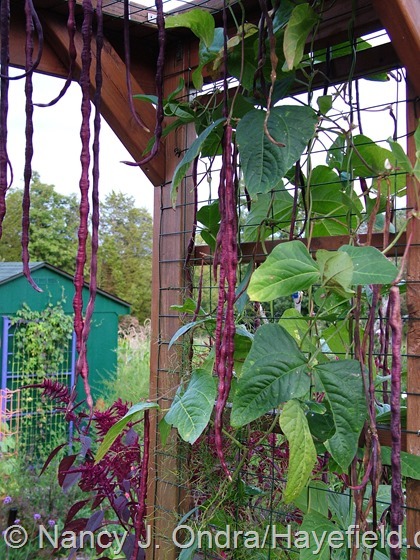 …and so are the ‘Red Noodle’ beans (V. unguiculata ‘Red Noodle’). But one of the things I’m most excited about this year is the ‘Glass Gem’ corn. Granted, not all of the husks were this pretty. The real thrill was seeing what was inside each one. I’ll be posting more about ‘Glass Gem’ later this month but had to share a few shots now. Yes, it really does look like this: no lighting tricks or Photoshopping required. 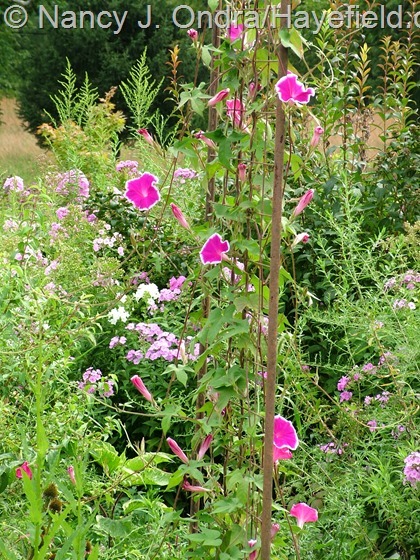 Above, variegated kiss-me-over-the-garden-gate (Persicaria orientalis ‘Shiro-gane Nishiki’) with ‘Hella Lacy’ New England aster (Symphyotrichum novae-angliae) in front of cut-leaved chaste tree (Vitex negundo var. heterophylla). 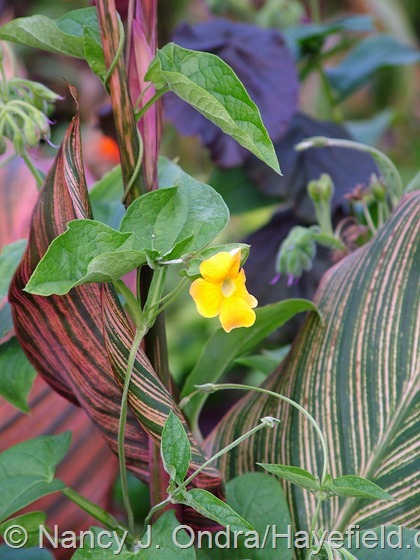 Below, ‘Star of Yelta’ morning glory (Ipomoea purpurea) climbing on a volunteer sunflower (Helianthus annuus). 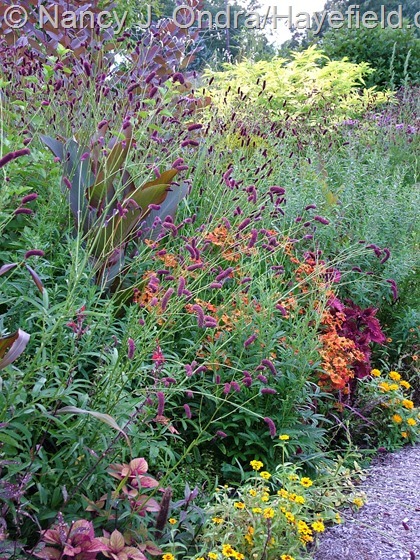 Above, almost-finished ‘Ruby Tuesday’ sneezeweed (Helenium) against Mellow Yellow spirea (Spiraea thunbergii ‘Ogon’). 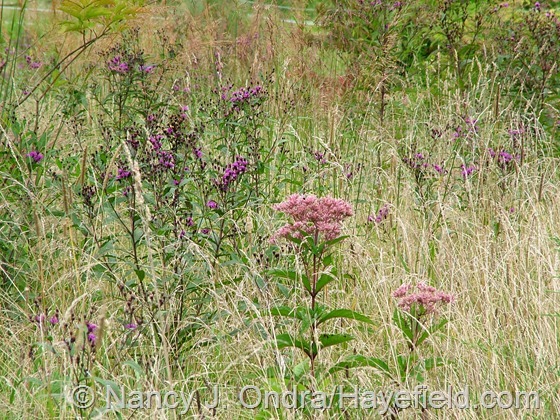 Below, Joe-Pye weed (Eutrochium purpureum) with New York ironweed (Vernonia noveboracensis) in the meadow. 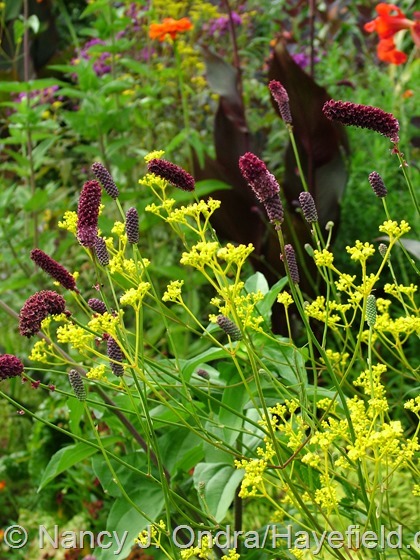 Japanese burnet (Sanguisorba tenuifolia): above against ‘Swift Creek’ privet (Ligustrum sinense) and below with golden lace (Patrinia scabiosifolia). 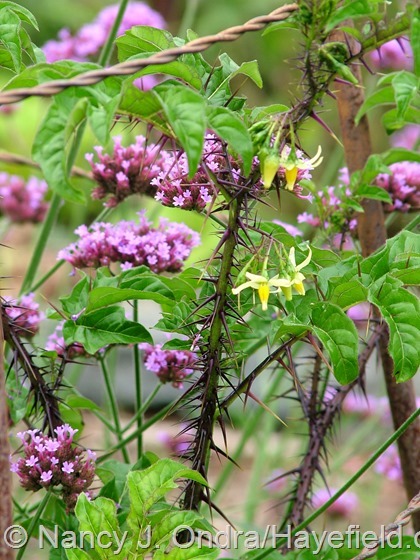 Below, malevolence (Solanum atropurpureum) with Brazilian vervain (Verbena bonariensis). 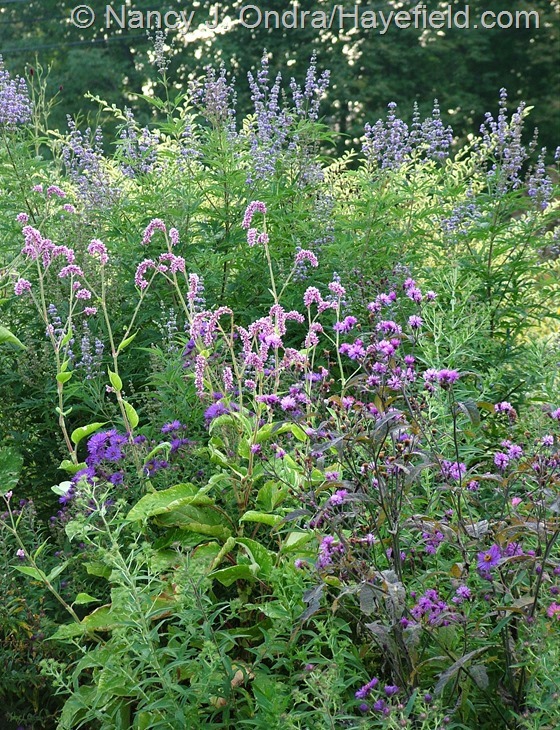 Above, a seedling summer phlox (Phlox paniculata) with ‘Jocius’ Variegate’ white snakeroot (Ageratina aromatica) and New York ironweed (Vernonia noveboracensis). 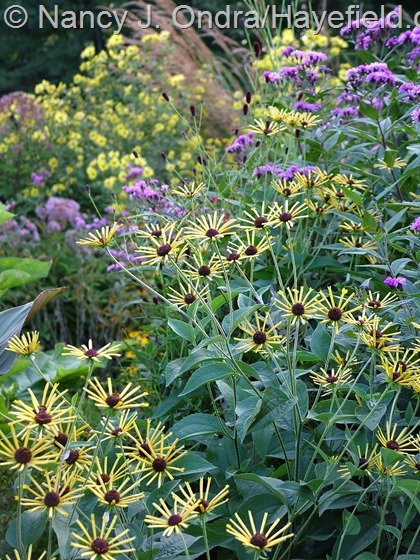 Below, ‘Henry Eilers’ sweet coneflower (Rudbeckia subtomentosa) with tall ironweed (Vernonia gigantea). 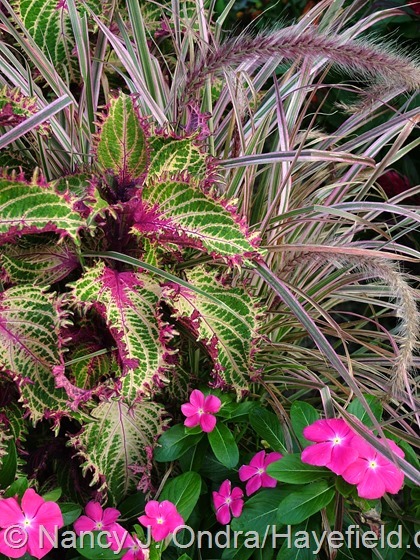 Above, ‘Cherry Sparkler’ fountain grass (Pennisetum setaceum) with ‘Pink Ruffles’ coleus (Solenostemon scutellarioides) and ‘Titan Rose’ rose periwinkle (Catharanthus roseus). 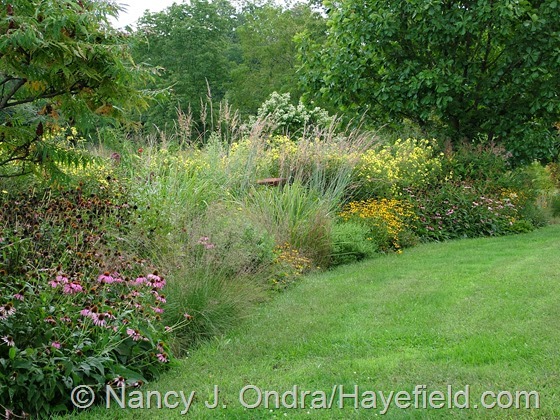 Below, ‘Fireworks’ fountain grass (Pennisetum setaceum) with ‘Autumnale’ fuchsia and ‘My Love’ Chinese plumbago (Ceratostigma x willmottianum). Another grass that’s terrific at this time of year is Japanese blood grass (Imperata cylindrica ‘Rubra’). Above it’s in front of ‘Gerald Darby’ iris; below it’s with ‘Coppelia’ sneezeweed (Helenium) and ‘Pineapple Splash’ coleus (Solenostemon scutellarioides). 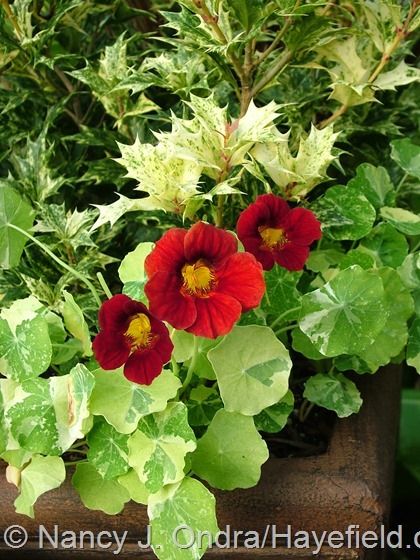 Above, a final combo, of ‘Alaska’ nasturtium (Tropaeolum majus) with ‘Goshiki’ false holly (Osmanthus heterophyllus). And now, a comment-free canter around the garden in general. You can find ID info for each photo if you place your cursor over the image. 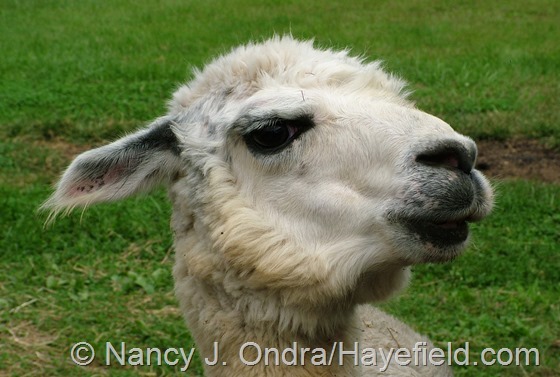 Before you go, a reminder to all alpacas everywhere: keep your fluffy little head inside the fence, where it belongs. Otherwise, you may have an unfortunate encounter with a patch of burs and end up with a stunningly bad haircut, and it’ll all be your own fault, so don’t give me attitude, because I did the best I could to fix you – got it, Daniel? 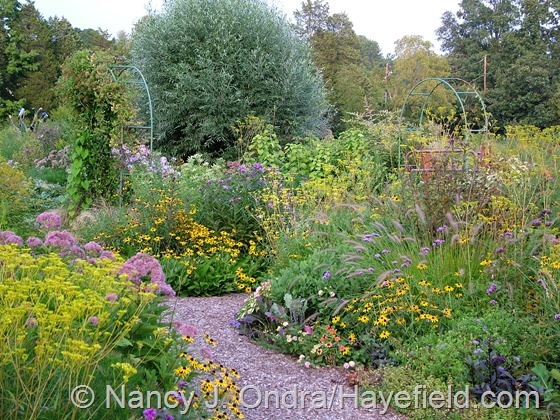 Now, for everyone else who is smart enough to keep their head where it’s supposed to be: enjoy the best of what other September gardens have to offer by checking out the list of participants in Carol’s main Garden Bloggers’ Bloom Day post at May Dreams Gardens. Thanks so much for visiting today! Thank you, Jorge, and happy spring to you! The lack of hurricane activity has been a big surprise this year, hasn’t it? And going from days in the 90s and nights in the 70 to days in the 60s and nights in the low 40s within a week has been hard to adjust to. But the lack of serious wind has been a big blessing so far. Let’s hope it keeps up for a few more weeks! Unbelievable beauty throughout your garden, Nan. Thank for the monthly inspiration you provide. It’s kind of sad to think that I’ll have only one more Bloom Day for this year, but this year has been so fun that maybe it will be good to have a rest for a few months. Maybe I’ll actually get a chance to visit some other blogs this winter! Oh, not jealous, really? Well, think of how good your garden would look if it were basically your full-time job as well as your hobby. That makes a big difference! 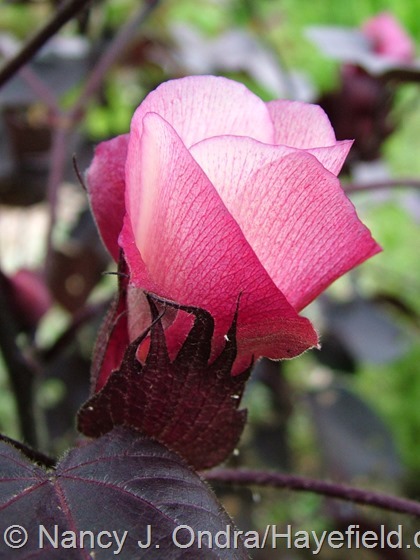 That Gossypium herbaceum ‘Nigra’ really stands out. What a magnificent plant! I assume it does well in warmer zones and this being a cooler summer than usual, did you have to do anything special to encourage it to flower for you? I love how the serrated leaves of the ‘Pink Ruffles’ coleus echo the fuzzy seed heads of the ‘Cherry Sparkler’ fountain grass. Brilliant contrasting texture! Yep, the cotton loves heat. I have no problem getting it to flower, but sadly, I very seldom get more than a more than a pod or two to ripen before it gets too cold here. 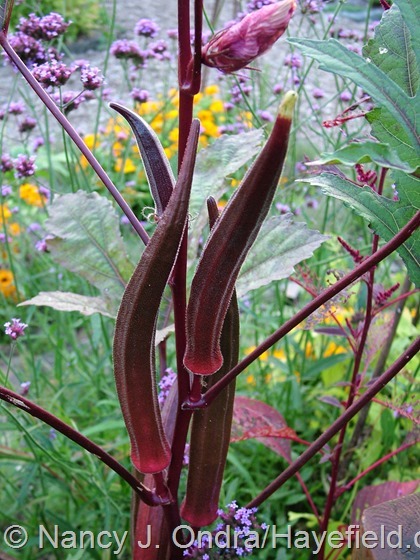 And you’re quite right: that’s Verbena bonariensis with the okra. I didn’t plan the combo, but it does look really good. 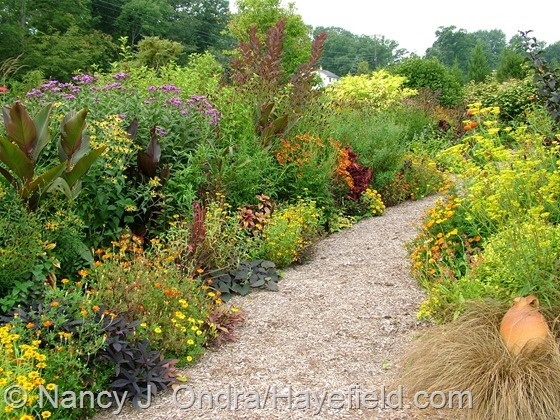 I can imagine how terrific your okra looked with purple perilla and marigolds; I may have to try that here! Awesome photos and educational about so many varieties. I’m like a little kid at Christmas waiting to see what emerges from my Glass Gem corn plants. If they are half as gorgeous as yours, I will be thrilled! You’re in for a real treat with your corn, Anne. I was very skeptical that it would be as good as the pictures that were circulating last year, but it really is. It’s so exciting to peel back each husk to see what new color combination you’re going to get. Have fun! Such an exquisite garden you have. 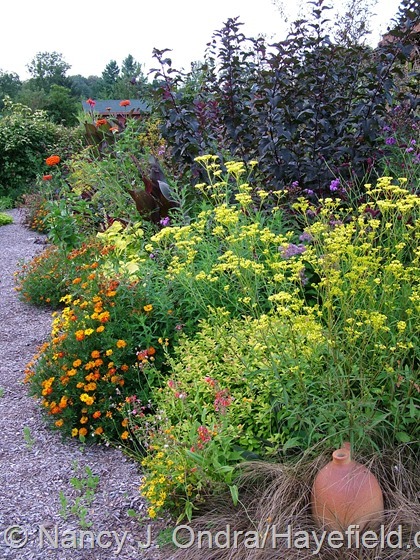 It appears very English in style but filled with plants that are seldom seen here UK gardens. 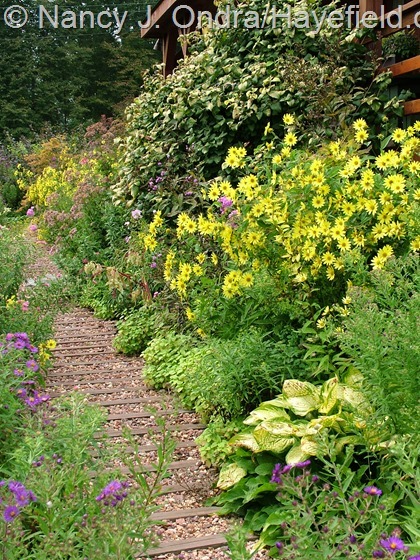 As a very frequent visitor to the Pacific North West, and an avid garden visitor, and a obsessed gardener myself, I have to say that I have rarely seen such a beautiful garden. 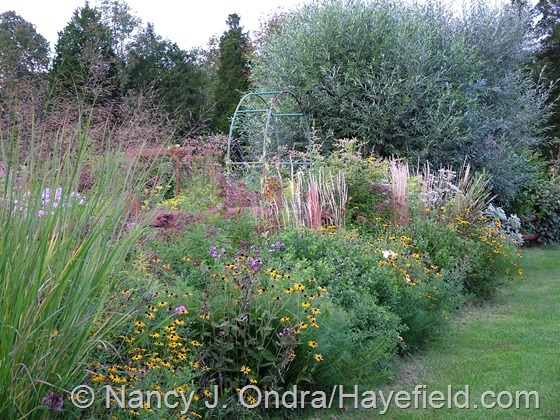 Also your photos portray its atmosphere and show the planting wonderfully. 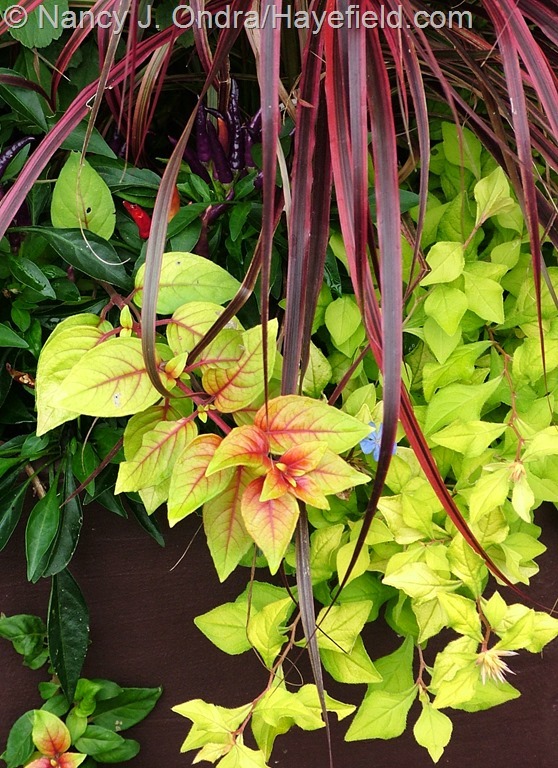 It’s the best plant centric blog on the net. My goodness, Nick – thanks ever so much for the kind words! I appreciate you taking the time to visit today. What’s the secret to getting beans on your red noodle beans? I’ve had no luck…twice. Your gardens are so pretty and inspirational as usual. I always see something new. Huh – I can’t think of anything to tell you, Melanie. 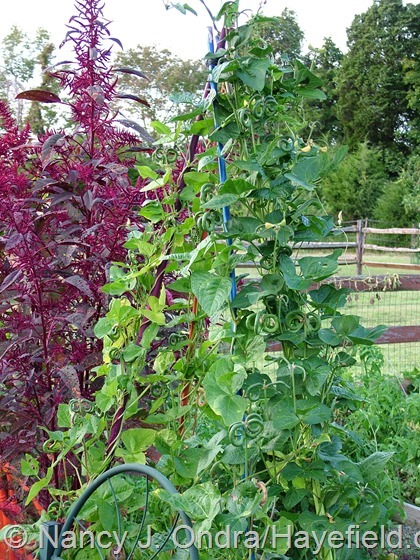 I planted the red noodles and pretzel beans at the same time, and they started flowering and fruiting within a few days of each other. I know you can grow the pretzel beans well, so it’s very strange that the red noodles aren’t cooperating for you. Plants are just funny that way. I have plenty of things that I can’t grow too, but fortunately there are lots of other things to try! An injured knee has sidelined me this fall. Your photos give me inspiration for next year! Oh no, Susan – how sad to have the stress of not being able to care for your garden on top of the physical pain. I hope you are able to rest up over the winter and be 100 percent by next spring. Take care! Nan, I know you have a fairly big property but your gardens are amazing. That first photo looks like a botanic garden, not a private property. Fabulous texture and color combinations. Your pictures are a joy to look at and a mine of info and ideas. Thanks for taking the time to do such a terrific post. It wouldn’t be as much fun to do the posts if I didn’t have readers, Linda, so I’m grateful that you took the time to visit and comment. That first photo is the middle path through my front garden. It’s only 25 feet long or so, but the perspective makes it look a lot longer. Happy Bloom Day to you! Nan! It’s all looking great! The Glass Gem corn is amazing. Mine never made it in the end. A few scrawny cobs with no kernels… It might have been a lack of fertilization, but I’m blaming the twice (or thrice) severe pruning by the Corte Eremo goats. I’m talking down to the ground when it was already over a foot tall. Now there’s a September war on trying to keep them away from the cosmos, and so far I’m winning. 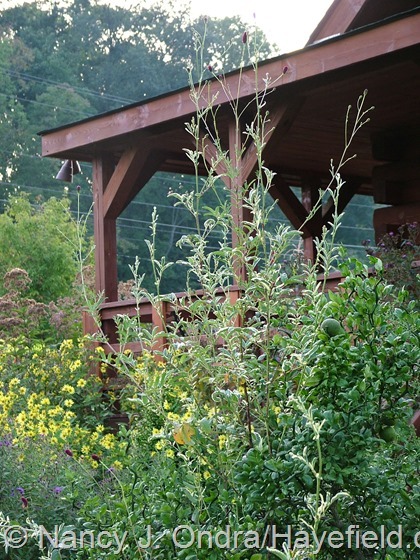 I have a gazillion okra seeds, and Atriplex hortensis… fruits of Solanum purpureum and S. quitoense are ripening. I wonder if the latter will grow on long enough to make viable seeds… So happy to see your garden in what must be one of the best months of the year, and one of your best Septembers ever. What a coincidence: I was emailing you at the same time you were leaving a note here. Well, at least your goats had a nice snack. Maybe you’ll could plant a corn patch just for them next summer. I’m looking forward to trying the seeds you sent me this summer and will return the favor! I love that your fall BD posts coincide with seed ordering time! Those Red Noodle beans are spectacular. Don’t be too quick to send in your seed orders yet, Denise. 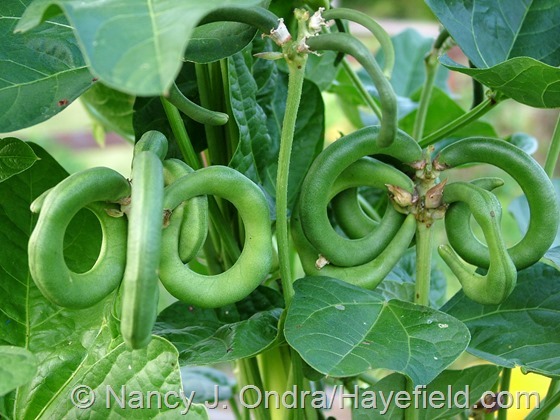 I plan to share the ‘Red Noodle’ seeds in my giveaway this fall, and lots of other fun things too. 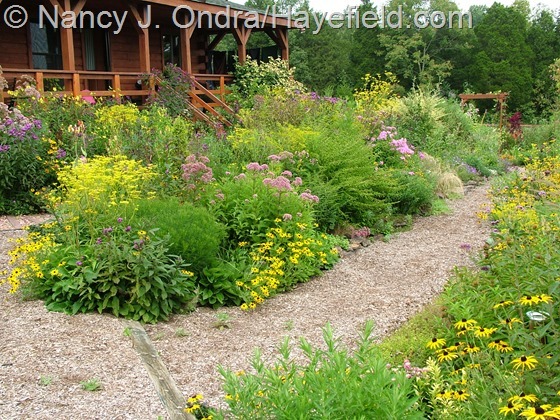 To say I have garden envy would be a huge understatement….so impressive! 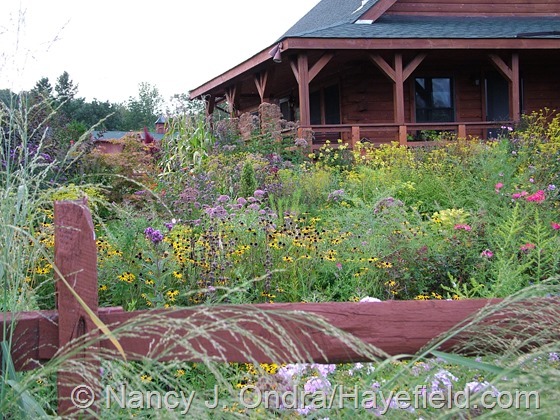 Thanks, Janie – isn’t fall a glorious season? All your vistas and plant combinations are wonderful! 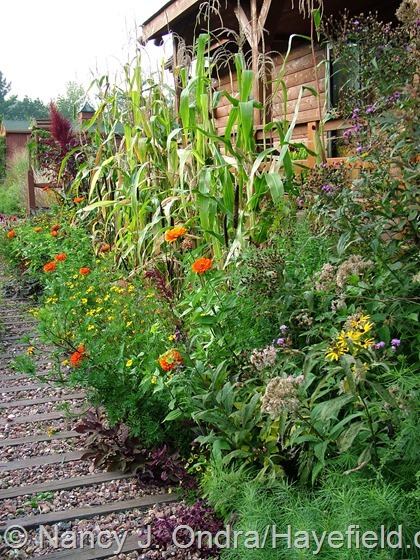 You’ve given me some ideas for upping my game in next year’s warm season vegetable garden – I’m going to look for seeds or starts of the purple tomatillos, the pretzel beans and the ‘Glass Gem’ corn. 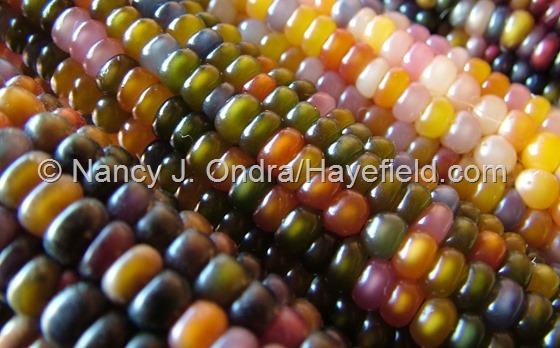 If someone could make jewelry that matches that corn, they’d make a mint! Ooh – wouldn’t that be a neat idea? And hey, if you don’t mind waiting a bit, check back for my November 15th post to see which seeds I’ll be sharing with my readers this year. Your photos are stunning. It was a real pleasure to walk through your garden and breath in the amazing beauty. My garden is unfortunately starting to be impacted by the stress of fall. I have to give a lot of credit to the regular rains and lack of big storms; otherwise, things would be looking rougher here too. You just never know from year to year with a garden, do you? I’m glad you enjoyed the tour, Charlie. Thanks for sharing your garden, wow is all I can say! Love the glass corn. looks like you did end up with decent pollination, They are so Jewel like. Your wordless stroll through the garden took me longer to get through than the pictures with text! There’s just so much to take in on every photo! Hey there, Frank. Ah, you remembered that just a month ago, I thought I wasn’t getting any ‘Glass Gem’ at all. A fair number of the first ears were on the small side, but they had lots of kernels. There are still a half-dozen years yet to harvest out front, and they are quite a good size, so I’m really looking forward to seeing how they turned out! My ‘Rosy Dawn’ isn’t blooming yet, but many other colchicums are. I can never figure out what prompts them to start blooming. Soil temperature? Moisture level? Magic? The latter, I suspect, Kathy, because the order they appear in here seems to change from year to year. They’re always welcome whenever they decide to appear! 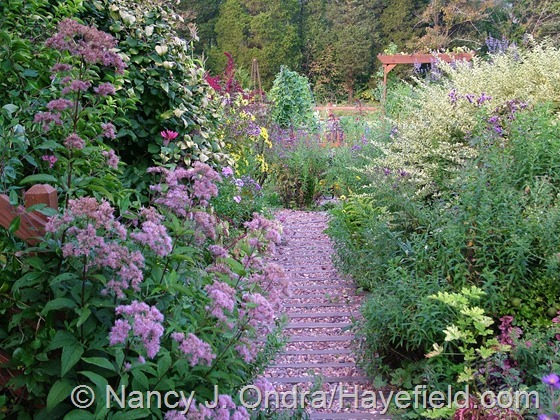 Your gardens and photos are better than a “fine” gardening magazine! I love your combinations . 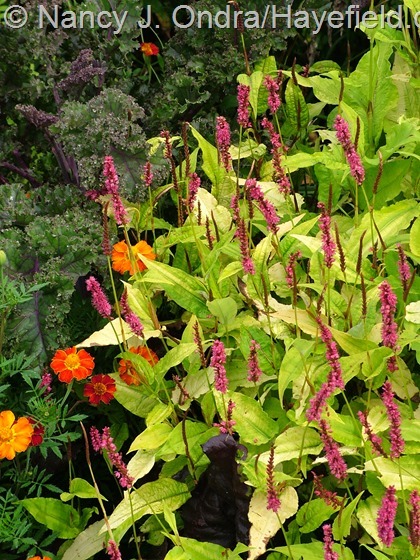 That black cotton is a knockout as well as that persicaria golden arrow…. . Thank you so much for all the knowledge and eye candy. It was a great rainy Sunday with your post and a cup of tea. And what a lovely comment to cheer a cool, rainy Monday morning! You picked out two of my particular favorites, Ellen. Thanks for stopping by! 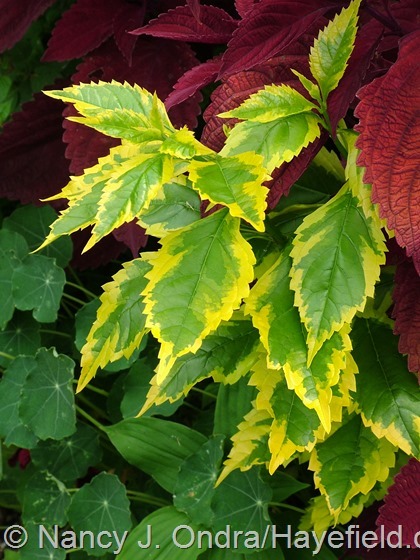 Nan, I’m really pleased to have discovered your blog and am finding many more ideas here than I have space to implement them in my small garden in Hamburg, Germany, but that wonderful acid yellow Patrinia will surely find its way in soon — perhaps together with a coppiced ‘Grace’ Smokebush. I will think of Hayefield whenever I walk past! Wouldn’t it be great fun to get to design (but then not have to live in the middle of) a “witch’s garden” with old medicinal and magicke herbes and shrubs plus a good-sized collection of plants that are just plain weird or a little creepy? “Malevolence” would get my very first vote in the creepy department! A rickety wicker trellis of red noodle beans, fabulous as they are, could fit in very well, too – and the creepily beautiful ghost bramble….! 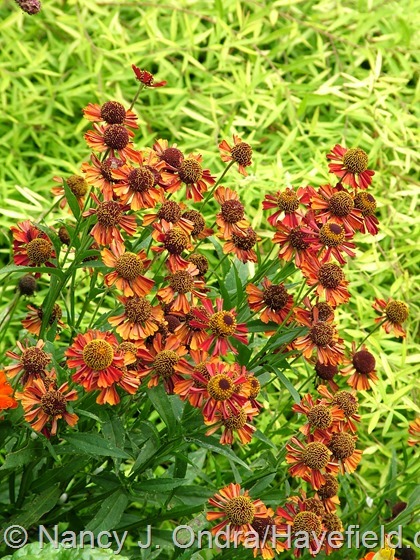 Some varieties of sneezeweed would be rather good, as well. Hmmm…you may have inspired my plans for what I used to call the “Happy Garden” but is now more herbs and such. 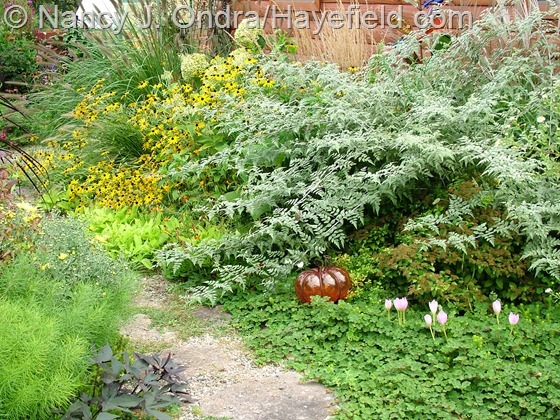 Next year it may be the “Creepy Garden,” with more spiny and poisonous plants. And those red noodle beans too. As they get longer, they really do have a sort of clammy, fingerlike feel as you brush past them. So many lovely plants as usual, Nancy! Beautiful done! Thank you, Julie! This is such a wonderful time of year to enjoy the garden. Happy Bloom Day to you! Oh my goodness. I don’t even know where to begin. You gardens are spectacular! 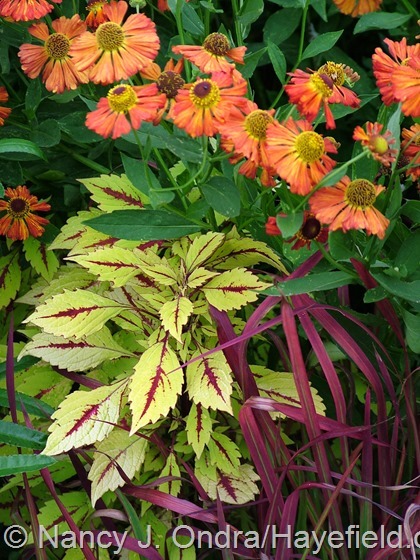 Your planting combinations are just divine–I’m planning to go through your post again more carefully and take notes so that I can try to replicate some of your beautiful groupings. I especially love your edibles. In SC, we’re just winding down with our summer crops, and I have my seedlings started for the fall, but I completely missed out on planting the ‘Glass Gem’ corn–the company was sold out when I tried to order. It’s fabulous! I’m in awe of the color, and must try it next year. I also love your beans. A restaurant we visited that has an amazing kitchen garden told me about the red beans, and i can’t wait to try those as well. Wow. I’m just looking out the window at our poor garden and coveting your beautiful blooms! Hope you have a lovely day! It’s a good thing we have lots of time to make plans for next year, isn’t it? If you eat the red noodle beans, I’d be really interested to hear what you think of them. I’ve heard mixed reviews, so I still haven’t gotten up the nerve to eat them myself. Nan, the garden looks gorgeous again this year! I especially love those wonky pretzel beans. Are they as good to eat as they are pretty? And the Glass Gem corn? A wonder. Just a wonder of nature. The pods are edible but pretty tough, even when young (in my experience, anyway). I think they’re really meant to be eaten as shelled beans; I know at least one of my readers has tried them that way. They’re so silly-looking that I grow them just for the amusement value. Love your blog, and your books. With all of that colorful foliage, who even knew you needed flowers? I thought I’d share my favorite tomatillo recipe with you from Sunset magazine. Thanks so much for the tip, Tish – that looks delicious, and it’s simple enough that I could actually make it. I really hope the fruits ripen soon! Nan, Beautiful, amazing, wonders, all! That yellow flowered canna is a beaut; now I really, really, really will plant a fuchsia autumnale-somewhere. I have admired it long enough. 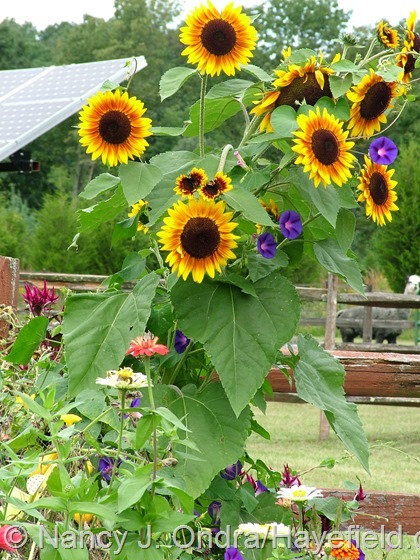 And, that volunteer sunflower picture is a cover girl! Thanks for another great month’s tour! Hey there, Donna. I was thrilled to find that ‘Autumnale’ fuchsia back in the spring, and I’ve been impressed with its rich color all season long. The flowers are nice too, but the foliage is really striking. Nan every single time I come here I learn something new ! 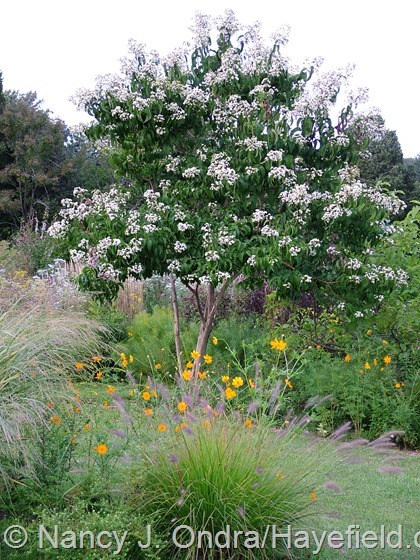 I’ve never even heard of ‘Heptacodium miconioides’ but love the idea of a late flowering tree. ‘Poncirus trifoliata’ is new to me as well. A cold hardy orange (even if it isn’t really all that edible), just amazing ! Do either of those trees ever produce seed ? I’m trying to think of something interesting I could send you as a thanks for all your sharing and educating. 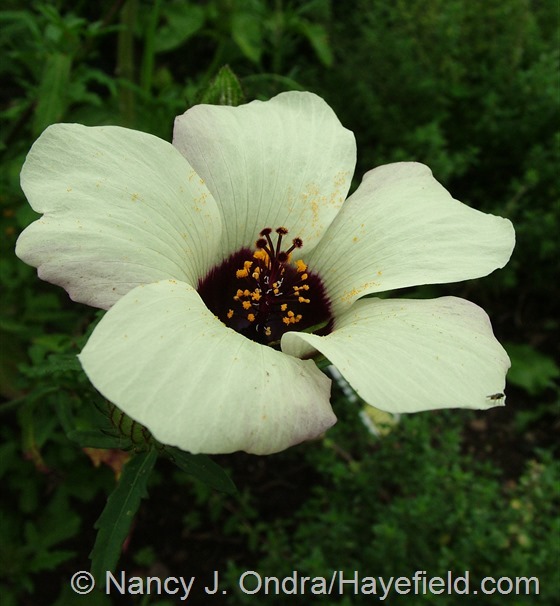 Have you ever grown a Sagebrush Mariposa Lily (Calochortus macrocarpus) ? The blooms are stunning. I collected a large amount of seed pods this summer. I feel like it might be something that could naturalize in a sunny, dry patch. Let me know if you want to try it! The heptacodium is a really nice tree, Jesse. 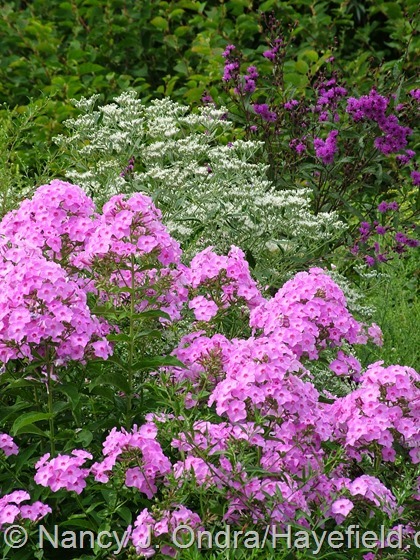 It needs a fair bit regular attention when young to develop a good shape, but the white flowers last from August into September and then the pink calyces look like another flush of bloom well into October. There’s beautiful peeling bark, too, for winter interest. I don’t know about seed, though: I have one tree that’s over 20 years old and one that’s about 8, and I don’t recall ever seeing seeds on either of them. The regular hardy orange (Poncirus trifoliata) is interesting, but ‘Flying Dragon’, with its curvy stems, is even more striking. It does set seed, and the seedlings look a bit curvy, but I usually pull them out when I see them. Really, one hardy orange is anti-social enough, but a whole patch of them would be too seriously spiny to contemplate. 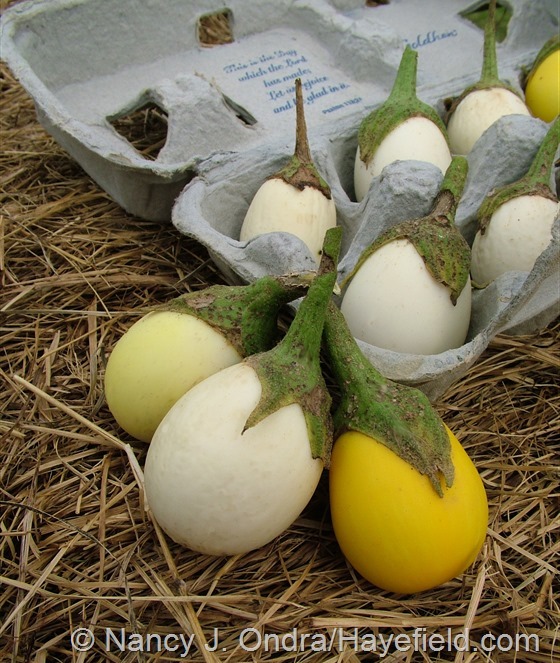 Thanks so much for the offer of the Calochortus seeds. That’s not something I’ve ever grown, so I had to look it up. I’m not sure it would be happy here, because my soil tend to be on the wet side, especially in winter, but I’m game to try it! Let’s discuss a trade. Sounds good. I’ll remember to ask for your mailing address when I send in my wish list during your fall seed give away then. I should also ask if you need any fresh Asclepias curassavica seeds, I enjoyed mine so much that I’ve already collected/defluffed more than enough for next year. Sadly no monarchs to feed this year though. Oh, yes! 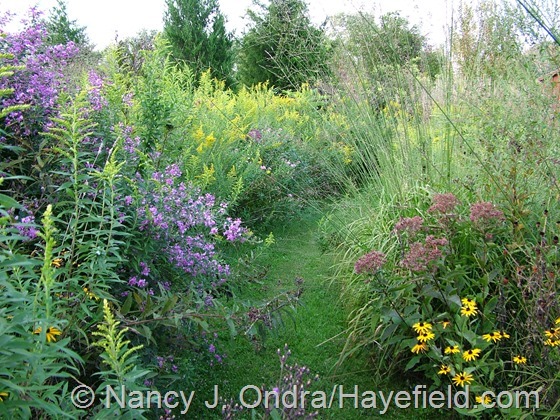 I’d like the Asclepias very much – thanks, Jesse! Hi Nan, Lovely posting, as always. How I wish my garden looked half as lovely. So sad that you lost Zepherine. I lost 4 roses to the dreaded disease, and grieved when James Mason went down. We now have a new one in another part of the garden. Where did you get the Hella Lacy aster?! 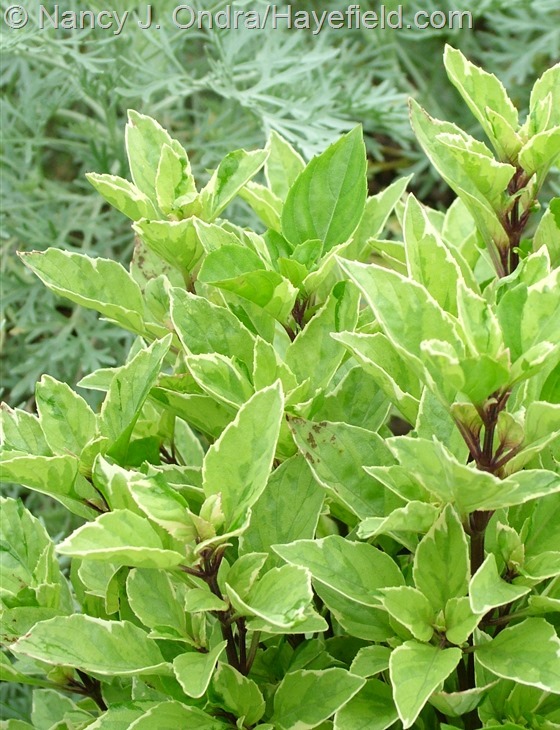 I know Hella and have hunted high and low for that plant to add to my garden and cannot find it! Hi Nora! I’ve enjoyed the company of ‘Hella Lacy’ for over a decade now. My original plant came from either Windrose Nursery in Pen Argyl, PA or from Holbrook Nursery in NC (both now closed, as I imagine you know). It’s sad that no one seems to be selling it these days. I would be glad to send you a piece for your garden next spring; she’s a beauty, and how wonderful that you actually know the original! I’ve heard it called “purple devil” too, which is a good name, but “malevolence” is even more deliciously appropriate for any plant dripping with black spines! 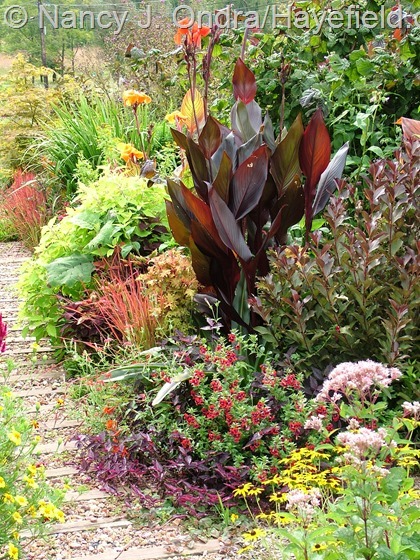 Your garden is such an inspiration, I love your plant combinations. 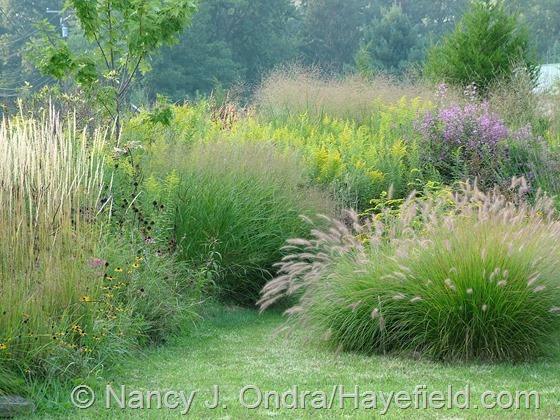 I’m going to try several grasses from seed for the next growing season so hope they will help fill in a lot. 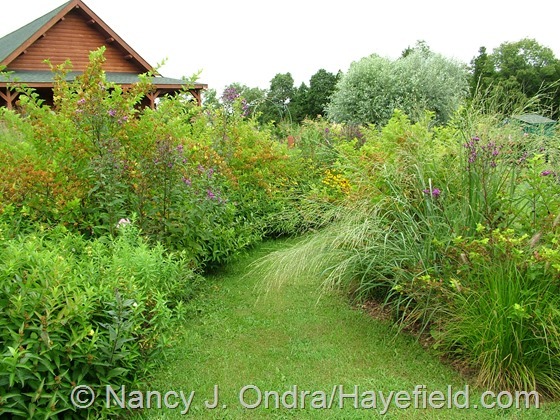 I love the blood grass, it seems very well behaved and low, and the Mexican feather grass from another post. I also like Persicarias and Sanguisorbas, and have a few, but to get others seems difficult since the local nurseries don’t seem to carry them, perhaps they think they are too invasive? Hi there, Hannah. 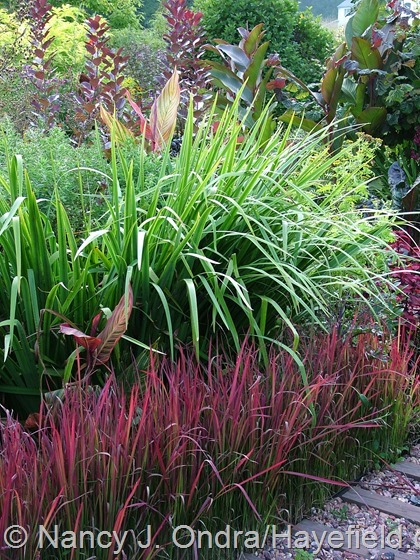 The blood grass needs to be grown from divisions, but the Mexican feather grass is very easy from seed, so that would be a great choice for a filler. I suspect the reason that more nurseries don’t carry persicarias and sanguisorbas is that many people want to buy plants that are in bloom, and these don’t start flowering until later in the summer, when sales are slow. The same goes for aconitums and many other late bloomers. 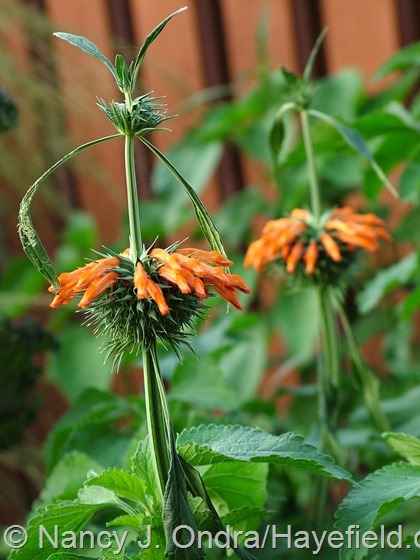 The tall ones, especially, don’t look all that interesting in spring and tend to be sprawly in nursery pots by bloom time. That’s likely why you need to rely on mail-order for many of the late-season beauties, unless you live near a great nursery that makes an effort to educate their customers. I wish you all the best with your new acquisitions, Allan. And oh, you have Shelties? Mom and I have shared our lives with several, and I miss my little Guinevere dearly, though she’s been gone for 7 years this month. I do remember the horror of burs with the Sheltie coat, but at least she was smart enough to stay out of them most of the time, and she enjoyed being brushed (which alpacas definitely do not take kindly). Please give your darlings an extra hug for me! How did you get your ‘Henry Eilers’ to be so upright? Partly by cutting it back by 1/3 to 1/2 in mid- to late June and partly by crowding it with so many companions that it can’t sprawl too far. Besides being wowed, every time I finish one of your fabulous Bloom Day posts I come away wishing I had more sun. But we work with we’ve got :). Happy belated GBBD! You wish for more sun probably as often as I wish I had more shade, Sue. As you say, we take what we get! Wow, I don’t know where to start. Outstanding horticulture. How many associates do your employ. he he. Always love to see your combinations Nan. Keep up the good work. Gee, if I could could Daniel and Duncan as garden assistants, then I could use their upkeep as a business expense! (Or maybe not….) Thanks so much for checking in, Greggo. Happy fall! Hi Rick! Your gifts ended up being many of my new favorites this year, and I’m really looking forward to passing some of them along in my giveaway this year. I don’t know if I’ll have anything you might find of interest, but if I do, you’ll get first pick! Hey there, Marcia! I’m happy to have you as a reader. I usually post my whole list of seeds to share on November 15. I’ll be in touch with you by email about the Pentapetes today. 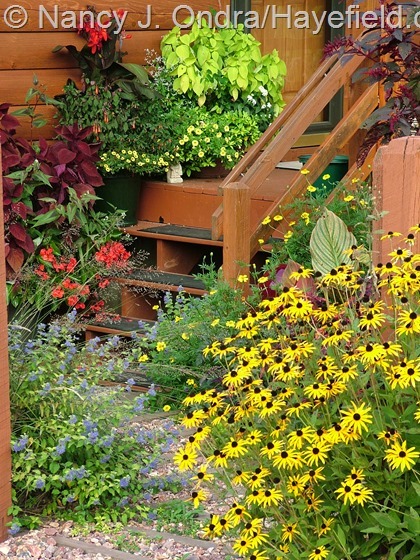 I love the way you use perennials and annuals together. The corn is beautiful, is it edible? Thanks for visiting, Eileen. 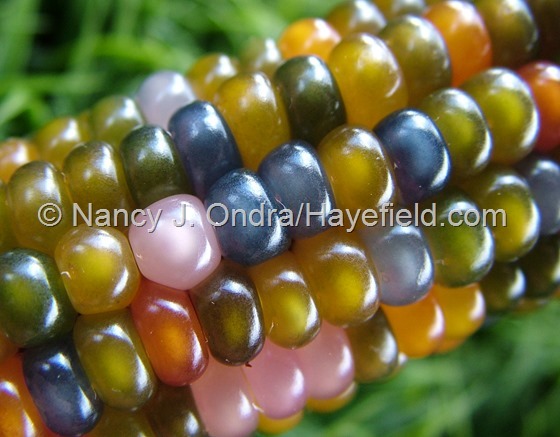 ‘Glass Gem’ is a flint corn: it can be ground into meal, and apparently it will pop too. I plan to try that soon!